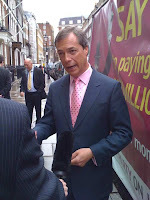 The UK Independence Party is the only moderate, democratic party to advocate Britain’s withdrawal from the European Union.Founded in 1993, we have grown to become the nation’s fourth largest party, and in the 2004 European Elections, over 2.7 million people chose to lend UKIP their vote and stand up for Britain. Still today, the Labour, Liberal Democrats and Conservative parties are 100% committed to our continued membership of this political union and they would rather the issue wasn’t discussed.Gordon Brown has refused the promised referendum, the Lib Dems also broke their referendum promise and the Tories won’t promise anything. In fact, Gordon Brown has ratified the Lisbon Treaty, which is simply the European Constitution in disguise. The expansion of the EU has allowed uncontrolled immigration from the former Warsaw Pact nations of Eastern Europe. Meanwhile, our public services are crumbling under the strain of the 1 million-plus people who have arrived on our shores. The government is powerless to stop this. The European Union costs us all over £40 million each and every day. To put that into perspective, it is enough to build a new, fully-equipped hospital every three days somewhere in the UK. It costs us far more than money, however. It is costing us our democracy. In the last 12 months, over 2,500 pieces of EU legislation – that’s 75% of all new UK laws – have come into force, and our parliament is powerless to stop or alter any of them. On June 4, please lend us your vote. Help us to ensure that the future of our nation is decided, not by faceless, unelected bureaucrats in Brussels, but by our elected representatives at Westminster. Say No to European Union and help UKIP ensure that the future of our nation is decided by those of us who live here. There can surely no longer be any question that Britain would be better off out ! Nigel Farage MEP , UKIP Leader Read more about our Campaign policies here.